First of all lets talk about why use a small 3/32” 7018 and not a 1/8”. 1. For field work, there are times when you might need to weld with a small inverter that runs off either 115 volt power or 230 volt power. It it sometimes difficult to get more than 90 amps using 115 volt power and an extension cord. Ever heard of the CLAMS acronym for 7018 uphill? I have posted this information several times in the past but I do believe its worth repeating because Its a good way for a welder and also a welding instructor to remember the critical variables that control the outcome of a weld. Especially a 7018 uphill weld. I really like the hot start feature. Its not on all machines but what it does is strike the arc at a hotter amperage than what is set on the machine and it makes perfect sense to have a few more amps to prevent the rod from sticking. Some machines allow you to set the hot start for a percentage of amps over 100% of the setting and also for a time…like one second or 2 seconds. Arc control is a great feature too although not always desired. With arc control feature the machine senses changes in voltage and is able to bump up the amperage when the arc gets too tight so it can prevent sticking. The down side of that is that it takes away the control the welder has of cooling or heating up the puddle with arc length. Length of arc - For welding with 7018 rods out of position, its important to maintain a very tight arc length except for when starting the arc. And when I say a tight arc length, I mean that you should be able to feel the rod rub a bit. I am not talking about forcefully cramming the rod in the puddle but rather just gently holding it very close and steady.. If you hold a long arc, its difficult to make the weld look good. Angle of electrode should be a slight push. I have found that if I aim for a 90 degree rod angle, that I will automatically have a slight push angle without even trying. But if I aim for a push angle, sometimes my angle gets too steep. And speaking of undercut, cleaning the mill scale off prior to welding helps to prevent undercut too. Yes the stick electrode will burn right thru the mill scale and its possible to not have undercut even with mill scale intact. Its just best practice to remove mill scale. Speed of travel is just slow enough for the ripples to be tight with no undercut. if travel speed is excessively slow, then heat will build up and the weld might be too convex or piled up. 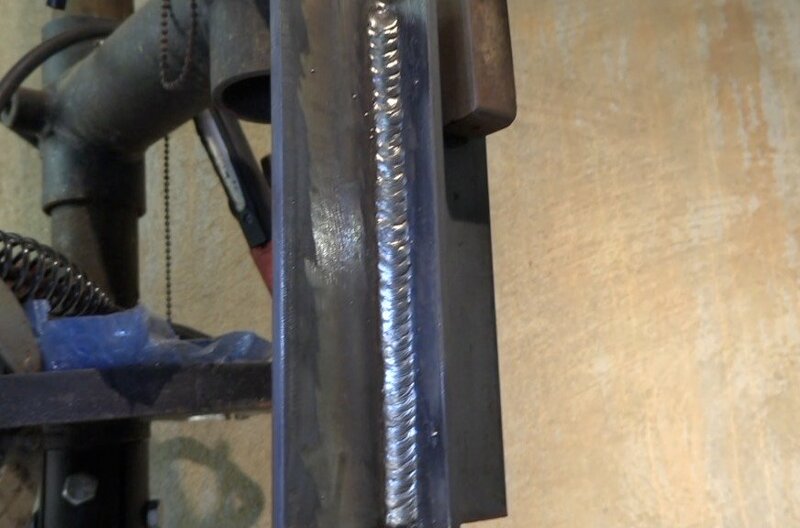 In the flat position, its pretty hard to travel too slow but for vertical uphill welds and overhead welds, traveling too slow will cause the weld to sag due to the forces of gravity, surface tension of the puddle, etc. Thinking about Current, length of arc, angle of electrode, manipulation of electrode, and speed of travel really makes you think about the fundamentals of welding...something we can all benefit from whether we are just learning, or have years of experience.